I've been itching to ink up the cute new Fairy Princess clear stamps again. 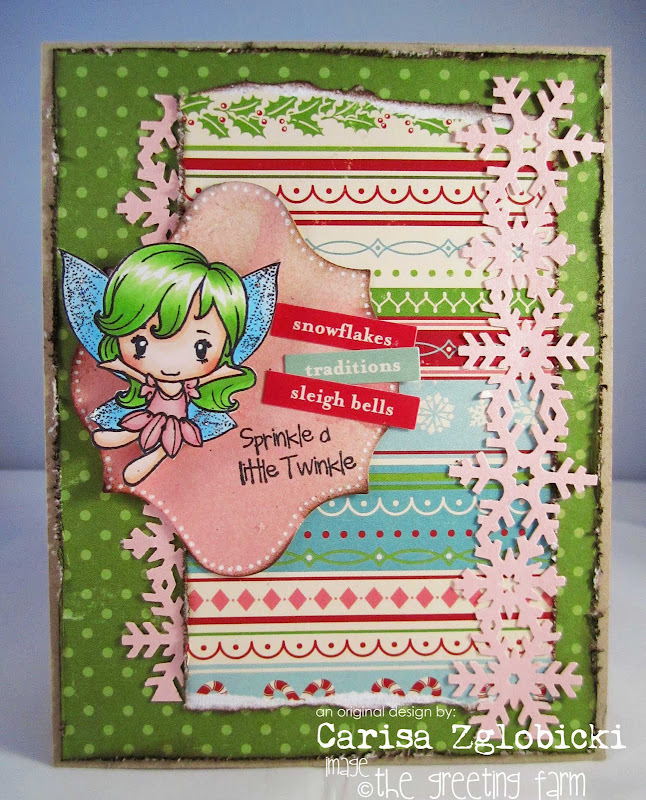 I thought they would look SO cute as little Christmas fairies so I pulled out my beloved October Afternoon Good Cheer paper pad (no sense hoarding it any longer) and using Jen's amazing Deconstructed Sketch put this card together. I love everything about it! They are available NOW at The Greeting Farm! I was thinking, maybe you'd like to have it to start off YOUR Christmas card mojo?! If so, leave your name below in the linky tool and I'll draw a winner next week to WIN my card! Who knows, I'll probably throw in some of my beloved October Afternoon Good Cheer paper to really get you started on making your Christmas cards :D No sense hoarding it, right?! Aww how cute! The touch of pink really adds interest to your card. :-) Thanks so much for playing along this week at The Kraft Journal! this is just too cute! I love that sweet fairy and yummy OA! Your card is Fabulous!!! Your fairy is sooo adorable!!! Wonderful card Carissa! I love that you flipped the sketch and that Christmas paper is GORGEOUS! Thanks so much for joining us for this week's Deconstructed Sketch! Carisa, as always your work inspires me. Hugs and I can't wait to see more. i love that you used that fairy! sooo cute!!!! Your coloring is so well done and I love the colors you chose for this card! Thanks for joining us at The Kraft Journal this week!